Fighting Your Bat Problems - Yes Pest Pros, Inc. Fighting Your Bat Problems - Yes Pest Pros, Inc.
registered in Indiana for bat extermination, bat-proofing as part of an Integrated Pest Management Program is the best way to keep them out. Why not use a chemical solution? There are no chemicals registered in the state of Indiana for use for bat elimination. Using unregistered pesticides is irresponsible and possibly illegal to boot. These measures only increase the chances of you or your family coming into contact with sick or dying bats inside the home. It’s best to have a professional residential and commercial pest control company use green methods to get rid of the problem. In the winter, bats seek our warm, dark places to rest during the day. An attic, gable vent or protected eave makes a nice home for a bat. Most of the bats common to Indiana are small and can squeeze through some tight spots. Once they find a comfortable nesting ground, they will return to it each morning. What damage can bats do? The biggest issue with bats is their droppings. Bat guano is smelly and disgusting, of course, but it can also make you sick. It can contain fungal spores that may cause serious lung problems. People who are more vulnerable, like children and the elderly, as well as healthy adults can develop a potentially deadly condition called histoplasmosis form coming into contact with these spores. 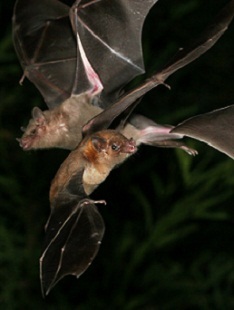 Rabies is another common issue with bats. Around 1 in every 20 specimens submitted for examination will test positive for rabies. Fleas and ticks and all of their associated diseases can be carried on bats and make their way into your home along with them. Since pest extermination isn’t an option with bats, bat-proofing is the best method of getting rid of them. It’s also a greener way of dealing with a Bloomington pest control issue. Integrated pest management techniques can use these green methods to reduce and eradicate all forms of household pests. Bat elimination starts with sealing off the infested area. Your exterminator will search for any and all points of entry that the bats may be using. Typically, there is one main entry/exit and a few other, smaller exits as well. An Indiana pest control professional from Young Environmental Solutions can fill any gaps and leave only one major exit open until evening. Once the bats have left to feed for the evening, they will close the last opening. The bats will have no way of reentering the home and will have no choice but to seek other accommodations.